In March 2016, 20 years on from the birth of its segment, the archetypal compact roadster is to be relaunched with a new name – SLC – significantly optimised technology and an enhanced look. The name change acknowledges the traditionally close relationship with the C-Class, from which much of the roadster’s technology is derived. 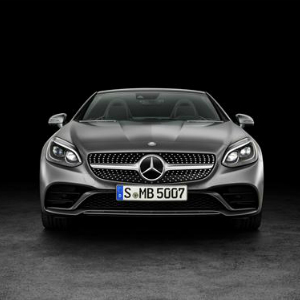 There are new additions to the model line-up – the sporty top-of-the-line Mercedes-AMG SLC 43 and the entry-level SLC 180. In visual terms, stand-out features include the standard-fit diamond radiator grille and the LED Intelligent Light System (optional extra). Prices will be announced when the SLC is available to order in mid-January 2016, with first cars arriving in showrooms from April 2016. The new Mercedes-Benz SLC has an impressive heritage to live up to: its predecessor, the SLK, which was launched in 1996, won fans around the world and achieved sales of around 670,000 units. Comprehensively refined and with a model line-up ranging from the high-torque and economical SLC 250 d to the sporty, high-performance Mercedes-AMG SLC 43, the new model has what it takes to build on that success. The SLC 250 d, SLC 300 and SLC 43 feature the sport/comfort-oriented 9G-TRONIC automatic transmission as standard, while it is available as an option for the new 115 kW (156 hp) SLC 180 (not available in the UK) and for the SLC 200. As part of the facelift, the Mercedes-Benz designers have further honed the roadster’s sporty look. The new front section, where the steeply raked radiator grille elongates the appearance of the arrow-shaped bonnet, is particularly striking. All SLC models feature a diamond radiator grille as standard. With DYNAMIC SELECT the vehicle characteristics can be adjusted instantly at the touch of a button, as the system modifies the engine, transmission, steering and suspension at the driver’s behest. In brackets: figures for version with 9G-TRONIC. Driving Performance is the AMG brand promise — and the Mercedes-AMG SLC 43 lives up to it in impressive style. The new model combines a 270 kW (367 hp), 520 Nm, 3.0-litre V6 biturbo engine with a modified version of the AMG sports suspension familiar from the Mercedes-AMG SLK 55, and the combination is reflected in the sporty performance figures, with the SLC 43 accelerating from 0 to 100 km/h in 4.7 seconds. The SLC 180 and SLC 200 are fitted with a 6-speed manual transmission. The sport/comfort-oriented 9G-TRONIC automatic transmission is available for these models as an option and fitted as standard in the SLC 250 d, SLC 300 and SLC 43. With DYNAMIC SELECT the vehicle characteristics can be adjusted instantly at the touch of a button, as the system modifies the engine, transmission, steering and suspension at the driver’s behest. The five modes – “Comfort”, “Sport”, “Sport+”, “Eco” and “Individual” are easy to select using the DYNAMIC SELECT button in the upper control panel on the dashboard console. The selected mode is shown on the colour multifunction display and also appears as a pop-up message on the head unit display. DYNAMIC SELECT is a standard feature in the SLC 300 and SLC 250 d. In the SLC 180 and SLC 200 with 9G-TRONIC, transmission mode selection is available as an option. The SLC 43 features an AMG Sport exhaust system as standard and uses the two adjustable exhaust flaps to adapt the sound to the mode selected via DYNAMIC SELECT. Drivers who choose the Dynamic Handling package (optional extra), which features a 10 mm lower chassis, an adaptive damping system, direct steering and ESP® Dynamic Cornering Assist, can also use DYNAMIC SELECT to specify the damping force in Comfort, Sport and Sport+ mode. Here the damping force at each individual wheel is automatically and continuously adapted to the current driving conditions. With the sports exhaust system the sound experience can be intensified as the acoustics can be adjusted via an integral exhaust flap in conjunction with the DYNAMIC SELECT transmission modes. The SLC 300 is fitted with the sports exhaust system as standard, while it is available for the SLC 200 in conjunction with 9G-TRONIC and the AMG Line/Sports package. The Audio 20 CD entertainment system has also been upgraded. It now features a bigger display (17.8 cm/7 inches) and can be combined with the Garmin® MAP PILOT navigation system; the navigation data is input using an SD card. Optimised route guidance is also available via Live Traffic Information. Affalterbach. There need be no contradiction between high driving dynamics and low fuel consumption. This is proved by the new Mercedes-AMG SLC 43: thanks to the combination of 3.0-litre V6 biturbo engine and 9G-TRONIC sports transmission, the 270 kW (367 hp) roadster consumes just 7.8 litres of fuel per 100 kilometres (NEDC, combined). Consequently, the open-top two-seater not only uses 0.6 l/100 km less than its predecessor, the SLK 55 with V8 naturally aspirated engine, but is also the most efficient six-cylinder performance roadster on the market. The specially developed suspension and model-specific mountings for engine and rear-axle gear unit are designed for high lateral acceleration and low roll. Even greater driving dynamics is optionally available with the AMG RIDE CONTROL suspension with adaptive adjustable damping and the Handling package with mechanical limited-slip differential on the rear axle. Compact, powerful and economical: “The new Mercedes-AMG SLC 43 unites the classic virtues of a roadster with exemplary efficiency. Weighing less and with lower fuel consumption, the new SLC 43 delivers a similar performance to the SLK 55 on the race track. This vehicle provides typical AMG driving pleasure in a compact open-top two-seater in line with the needs of today’s market,” said Mercedes-AMG chairman Tobias Moers. The 3.0-litre V6 biturbo engine offers impressive performance with its 270 kW (367 hp) maximum power and peak torque of 520 Newton-metres: sprinting from rest to 100 km/h in 4.7 seconds, its top speed is electronically limited at 250 km/h. The key factors behind the snappy, agile roadster driving experience are the newly developed front and rear axles, new engine/rear-axle gear unit mountings, stiff elastokinematics and highly precise steering. Even greater transverse dynamics is made possible by the optional Handling package with mechanical limited-slip differential on the rear axle. The new SLC 43 represents the entry point into the current roadster world of AMG. Apart from the renaming of the SLK to SLC, the open-top two-seater also comes with a new AMG nomenclature. The familiar two-digit combination typical of AMG underscores the SLC’s unmistakable membership of the AMG family. Due to its overall “engineered in Affalterbach” package of typical AMG driving dynamics, engine response and high efficiency, the SLC 43 is very competitively positioned in the segment. The 43 stands for the further-developed AMG 3.0-litre V6 biturbo engine. The Mercedes-AMG SLC 43 is therefore the first V6 model from Affalterbach to feature the new nomenclature. This will be successively introduced to the future model portfolio.